Digesting channel intelligence takes focus; acting on it requires commitment; building on it means laying foundations that didn’t need to exist all that long ago. But there’s no need to whack at channels and hope for the best. 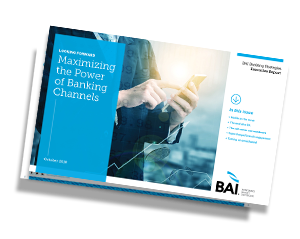 Perhaps properly tamed, today’s plethora of channels will help us create the seamless, peerless, connected banking experience of the future—and help us, in fact, to dig deeper. This executive report will help get you there. Forward thinking banks have a chance to advance beyond the walls of the institution and build exciting bridges in the customer journey. You’ve heard data is the new gold in financial services. Now’s the time to mine your operation’s numbers to staff up right and deliver outstanding service. Fraudsters know call centers are more vulnerable than other points of entry. Here’s how financial institutions can mount a robust defense. The channels look and feel different—but customers see them as one. Here’s how to get the best from branches through contact center tools. A stellar website used to be enough. But today, savvy banks know that connectivity is good for customers and smart for business.